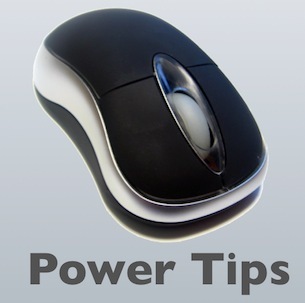 In this post we have collected the best tips for saving time while using your mouse, keyboards and trackpads. We will be adding extra tools, add-ons to your PC. MouseZoom is a Firefox add-on that lets you zoom in and out of web pages. It’s useful for getting an idea of how big a long page is and for expanding text that’s too small to read. After installing the add-on, hold down the right mouse button and spin the mouse wheel to zoom in and out of the page. A similar tool for Chrome users is ZoomWheel which also uses the wheel in conjunction with the right mouse button. After installing it, click Chrome’s Menu button, select Tools, Extensions and click Options under ZoomWheel to configure it. To go to a new website, you have to click the address bar before typing the URL. In Firefox, you can skip this unnecessary click by installing Focus Keyboard. When you start typing a URL, it automatically appears in the address bar. You can even use the paste shortcut, Ctrl+V, to paste an address without clicking first. After installing it, click the Firefox button, choose Add-ons then Extensions, and click Options. From here, you can configure the add-on with its selection of extra options. For example, you can specify that the search box, rather than the address bar, is the target for typed text. If you’re filling in forms on a site, remember that the Tab key automatically jumps from one input box to the next, no matter where they are on the page. Many websites show thumbnails of images, which you have to click in order to see the full picture. Facebook, for example, shows images in the news feed, but reduces the size of images. To automatically display the full-sized version when you hover your mouse over a thumbnail in Chrome, install Hover Zoom. It works on several sites, including Facebook, Twitter, Flickr, Reddit and Tumblr. There are add-ons for both Chrome and Firefox that let you use mouse gestures to navigate the web more easily. Instead of moving the mouse pointer to the Back button and clicking it, for example, you can simply right- click and swipe left. To go forward, you right-click and swipe right. A variety of actions including opening new tabs, scrolling web pages and switching tabs can be performed with simple mouse gestures. In Chrome, try Gestures for Chrome Plus. After installing it, click the Menu button, Tools, Extensions, and then the Options button to see all the commands. Firefox users should install All-in-One Gestures, then click the Firefox button, Add-ons, Extensions and Options to see the commands. When you scroll with your mouse wheel in Chrome, it takes you down the page in jerky little jumps. To smooth the scrolling, install Chromium Wheel Smooth Scroller (bit.ly/smooth3l3). Right-click the button in the toolbar and select Options. This lets you determine how much the page scrolls with each click of the mouse wheel or when using the keyboard. When you scroll to the bottom of the screen, the page will bounce like it does on the iPhone and iPad. Don’t forget to check out the Mouse section in the Control Panel. It has lots of useful features, such as swapping the left and right buttons for left- handed people, and ClickLock, which lets you click and drag things without holding down the button. You can also adjust the mouse pointer speed, define the number of lines to scroll when the wheel is turned one notch, and find alternative sets of mouse pointers if you fancy a change. It’s easy to accidentally touch the trackpad on your laptop while you’re typing. To prevent this, use Touchpad Blocker. When you Start typing, the trackpad is automatically disabled, but is re-enabled when you stop. MadAppLauncher lets you run programs with a couple of key presses. Open it by clicking the icon at the right side of the keyboard and selecting View, ‘Drag and Drop’. Drag programs from C:\Program Files and drop them onto the keys. Then select Settings, Hotkey and set the key to use, for example Ctrl+Y. You can now press this combination to access MadAppLauncher and run a program with one keypress. You could assign Firefox to the F key, Chrome to C, Paint to P, Notepad to N, and so on.